(Broomfield, Colorado) – June 22, 2017 – Phonesuite, a leading provider of communications solutions for the hotel industry for more than 25 years, will feature demos of its groundbreaking Voiceware Browser-Based Console at HITEC 2017 booth #1319. Loaded onto any tablet or other device with an internet browser, the powerful interface allows staff the freedom to answer calls and handle guest-related communication requests from anywhere on or off property, increasing efficiency while delivering superior guest service. No longer tied to a bulky PBX console, staff members have the freedom to access increased functionality and an intuitive, easy-to-use interface by leveraging any PC, tablet or smartphone. Using a Bluetooth headset and a free downloadable softphone app with Wi-Fi access creates an "on-the-go" hotel communication solution available anywhere throughout the hotel. Elevated functionality includes the ability to find guests or staff quickly by name and then call or transfer with one click, a pop-up guest information screen that displays key information such as name, native language, VIP status, group affiliation and more, and a robust wake-up activity log. The unprecedented access to full-function communications anywhere, anytime gives users the flexibility to respond to operational matters while continuing to prioritize guest relations. 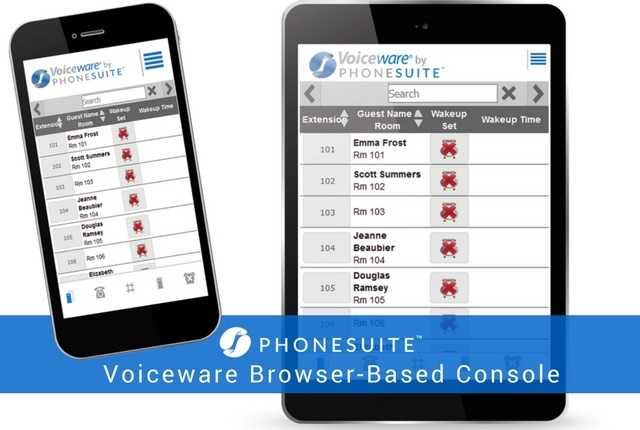 Phonesuite CEO Frank Melville stated, "Our Voiceware Browser-Based Console represents an important revolution in the hospitality industry--one that allows hotels to move toward seamless communications along with greater efficiency and productivity. This innovation has been a winner for early adopters, because it literally frees hotel staff from the restrictions of a desk and empowers them to elevate guest services to the next level â€“ all included at no extra cost from Phonesuite. The Voiceware Browser-Based Console will be just one of the suite of advanced products we'll be highlighting at our HITEC booth #1319, so we hope all attendees will stop by, get a demo and learn more about taking hotel communications to the next level."